Evergreen, masses of flowers in either white or purple, Hardenbergia violacea flowers in spring and is easy care. If you are looking for an easy care Australian Native climber then this could be the one for you. Also known as the False Sarsaparilla and sometimes The ‘Purple Coral pea’, we think that Happy Wanderer is by far the best common name. This a rambling twining plant that has been a favourite with Australian gardeners for many years. A cultivar named after the well known landscaper Edna Walling, hints at it long term use in landscaping. 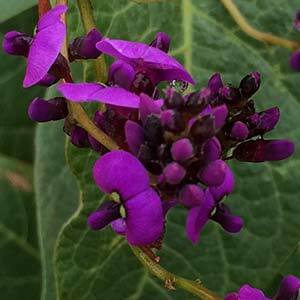 Hardenbergia violacea or ‘Happy Wanderer’ is a tough evergreen plant that certainly lives up to its name. 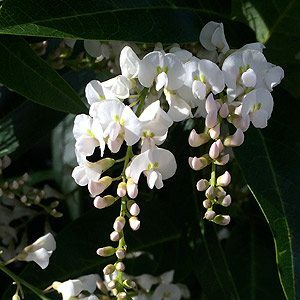 It will happily scramble through other shrubs, grow on fences with some support and training and with masses of flowers over a long period is a joy in the garden. Showy purple/pink to white flowers Hardenbergia makes a great display in late winter to early spring. Flowering is best in a sunny position, in deep shade flowering can in fact be disappointing. It does in fact wander around, however it is not invasive and it is a plant that can be pruned heavily if required. Found along the coastal ranges from Queensland and New South Wales through to Victoria, Tasmania and South Australia Hardenbergia is widespread. H. Violacea – The species has purple flowers – pictured below. H. Violacea Alba – Attractive white flowers. – pictured above. A sunny position and are well drained soil are the two most critical aspects. However a frost free position is also desirable, as a heavy frost will knock the plant back quickly. Pruning on a regular basis will keep ‘Happy Wanderer’ in check and promote a bushy more compact growth habit. A few ‘improved’ cultivars are also available which are said to naturally have a amore bushy habit, one to look for is ‘Purple Clusters’. Grown on a fence, a trellis or over a stump H. violacea works well as a climbing plant. It is also a plant that is suited for use as a ground cover plant, left to cover an area of around 2m. Again it can be pruned back to great a denser habit. We have been asked what causes brown spots on the leaves and eventual leaf drop on Hardenbergia. The answer is almost always, poor drainage or over watering. Another issue is an excess of salts in the soil, often caused by fertiliser. When you water the plants, water them well, and do not do this very often, the occasional deep watering helps flush away excess salts. Always allow the soil to dry well between waterings, and try not to water the foliage. You will find in the natural environment that Hardenbergia grow best in rocky soil, often on sloping ground. For some reason it is suggest to use ‘a premium potting mix’ or ‘humus rich soil’. This is simply not the case with these plants.